Shimmy beaded curtains from ShopWildThings are each created with hundreds of super-shiny reflective squares that shimmer gloriously in gleaming silver or lush light gold. Add dazzle to your special event with these Shimmy bead curtains in doorways and as backdrops below our matching hanging Shimmy chandeliers. Shimmy silver and gold curtains with square-shaped shimmering beads are available in 6-foot and 12-foot lengths. The width is 35 inches. 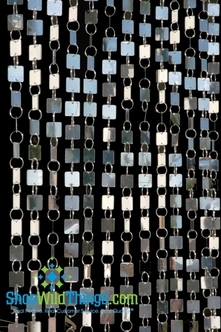 Each rod holds 20 strands of 1/2-inch square mirrored beads. The lightweight, flexible PVC mirror squares are each attached with a jump ring, which makes it easy to shorten or lengthen. Simply add or subtract jump rings to adjust. Watch our video to see how they sparkle and shimmer in the light and breeze. Create a glamorous setting for weddings, galas, outdoor celebrations, country club dances or the high school prom. Tiny, mirrored Shimmy squares in light gold or silver decorate our Shimmy chandeliers, too. This 2-tiered Shimmy chandelier is 8.5 inches in diameter and 19 inches in overall length. The inside strand is 12 inches long with 35 strands of 1/2 -inch square beads. The outside tier is 19 inches long with 45 strands of beads. Order our optional light kid or LED light saucers to illuminate this elegantly crafted chandelier. Our Kalina chandelier has tiny silver Shimmy square beads interspersed with clear acrylic crystal beads. It's 9 inches in diameter and 23.5 inches long. Display our dazzling Kalina chandelier on a table with our centerpiece boost kit. Order a kit with a Kalina chandelier and a 29-inch riser or a 39-inch riser. Each kit includes an 18-inch hollow, clear acrylic tube. Fill with water and insert our submersible LED lights or water pearl beads that take shape when you add liquid. These kids also come with acrylic base and top plates.